Sire: Lavender Park Jamari, Grandsire Warramunga Downs Macguire, Granddam Lavender Park Jasmin. Dam:Petlyn Park Bonita, Grandsire Petlyn Park Bravura Heart, Granddam Petlyn Park Kiera. Oscar was awarded first place junior grey male at both Victorian Colourbration and AAA National Show. 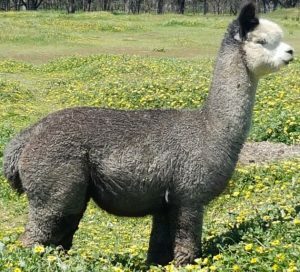 Unfortunately he developed a break in his intermediate fleece and wasn’t shown. His highly crimped style of fleece is even across his body and extends into his brisket. He has good density and length. His saddle is even medium grey with no spots in it. He is not your usual Tuxedo grey with only white on his face and small foot socks. He has started working. While we don’t have a lot of unrelated females, the ones that he is mated to should supply us with some stunning progeny.